UPDATED: Nationally acclaimed Washington DC based newspaper The Hill has picked up on this endorsement and run a story on it. Locally, mid-coast Maine’s The Times Record ran an editorial, Collins Vs. Bellows. It’s A Race. Shenna Bellows Outraises Susan Collins In Latest Fundraising Quarter. Today, the Progressive Change Campaign Committee (PCCC) is endorsing Shenna Bellows for the U.S. Senate in a key Senate upset race against Republican incumbent Susan Collins. In the latest fundraising quarter, Shenna Bellows outraised Susan Collins. Collins reported $314,921 for the quarter while Bellows raised $331,454. Over 80% of Bellows’ contributions were $100 or less. Today’s national endorsement and fundraising email to PCCC members is copied below. The PCCC is fundraising for Shenna Bellows’ campaign from it’s membership base of over 5,700 members in Maine and nearly 1 million members across the country. During the 2012 election cycle, the PCCC members raised over 2.7 million dollars for candidates through 250,000 small-dollar donations including hundreds of thousands of dollars for multiple House campaigns. PCCC members made over 2 million calls to voters for progressive candidates. Over 30 PCCC-endorsed campaigns won, including Elizabeth Warren (D-MA) for U.S. Senate and Alan Grayson (D-FL), Mark Takano (D-CA), and Keith Ellison (D-MN) for Congress. See the full record of PCCC victories here. HUFFINGTON POST REPORTS: Democrat Shenna Bellows Raised More Money Than Republican Sen. Susan Collins Last Quarter! Collins helped block the public option, strong Wall Street reform, and protections for seniors and veterans. Control of the U.S. Senate is at stake in 2014, and this insurgent progressive could defeat Maine’s Republican senator! We’re proud to endorse Shenna Bellows for Senate. Help “expand the map” and win this key race — donate $3 to Shenna today! Shenna is former Executive Director of the Maine ACLU. We call Shenna Bellows the “Elizabeth Warren of civil liberties” because she’s campaigning boldly on constitutional freedom and economic populism. Shenna believes in repealing the Patriot Act, expanding Social Security, and holding Wall Street accountable. She raised a whopping $331,454, and over 80% of contributions were $100 or less! Shenna is running a grassroots campaign, fueled by lots of people. “One of the biggest threats to our democracy is big money in politics, so it is refreshing to see that grassroots giving from real people can triumph over corporate interests,” Bellows told the Huffington Post. 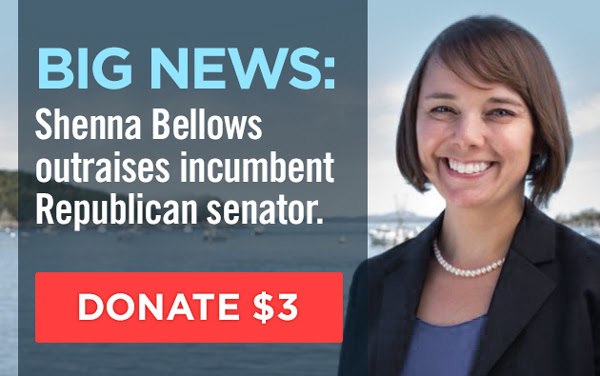 Can you donate $3 to elect Shenna Bellows to the U.S. Senate? Click here.